Clockwise from left to right (de la gauche dans le sens de l’horloge): Emma Brest, Pier Paolo Gobbo, Alice Petit, Alexandra Bogdanova. 1/ How did you come to the ballet? I’ve been in the theatre since the age of four. I think I’ve always loved the stage. Actually, I wanted to be an actress. I was born in Auckland, at Saint Helier’s Bay, and lived there till I left for England. Come home from class, put your swimming togs on, and just jump into the sea. I couldn’t imagine not living beside the sea. When I came to London, I had to imagine the sea was just – over there. That sort of Empire thing. Or “The Rebel Boy, a Tale of France”. I was thrilled by those lines. But I’ve never heard them since! The Scottish teacher would shew me various things, from Shakespeare. I had quite an interesting background in poetry, and different readings, that captured my imagination. When I first read Françoise Sagan’s Bonjour Tristesse, I could not believe the maliciousness of it! The precocious nastiness of that spirit. We were so naive! I can’t remember the rest of the words. I said this, and was engaged on the spot. So it was that I was on stage at 4 ½, watching people. I don’t think I made any difference between going onto the stage, and being in ordinary life. I don’t even know whether it was a game. I was never taught any of the ballets, I had just to learn on the end of the line, and follow, and then as soon as I’d learnt enough to be recognisably the same as the eleven other girls, they’d change the choreography. Finally, I got so annoyed, that I once I sat down on a riding crop on stage, and refused to budge. The audience noticed it, and loved it, and that is how I became something of a monster. My mother took me off the stage at age five, as I was indeed getting to be a little monster. As the baby of the company and very spoilt, I was being helped to sing, to act, to learn lines, to know how to find the right lighting for effect, and so on. I even learnt some acrobacy. When I came back, I was taken to the teacher, Valerie Valeska, a Scot. Valeska was a stage name, her real name was Wilson I believe. She was a very theatrical person, and didn’t fuss about technique too much. She put on very good shows, with scenery, costumes, lighting. I still have some photographs. They were great fun. She had adults, and some professionals, some singers, some actors. I think even now, they were very good as performances. A lot of work went into them, they were well-produced and technique was – well, as long as it passed. I learnt it later, when I decided that I wanted to dance. After I’d seen the Borovanski Ballet on tour. I had danced for many years without too much trauma over technique, because I wanted to be an actress. But when I wanted to really get down to studying technique, my years of having done acrobacy, and tap, I had a sense of rhythm, I was supple, and with a bit of willpower and a bit of intelligence, I could start to make up for lost time. And having once seen how Rowena Jackson worked, to get into the Royal Ballet School I worked five to six hours a day. 2/ With whom did you study with at the Sadler’s Wells School? When I first went to RBS George Goncharov was teaching there, and this was my first real introduction to the Vaganova School, as he had been her partner. I loved his classes. Winnifred Edwards, whom I liked, who had a wonderful back, and port de tête, a sense of presence. And there was someone who encouraged me, very much , I’ve forgotten his name – he always wanted to see something DANCED! I had a passion to dance, and obviously this pleased, and amused him. Afterwards, I went to Vera Volkova, and learnt so much from her. Again, the back, the holding of the back, the pirouettes. I got as much from listening to her correct others, I was avid to learn, and she did not necessarily correct me, as she had people like Frank Schaufuss, Margarethe Schanne, Margot Fonteyn, Moira Shearer, in her class. And so you would be watching them, in that grotty, dirty little studio in West Street. Listening to her advice, her corrections, was an education in itself. Those stars were not too high and mighty that they could not be corrected. Then I went to Audrey de Vos, because she lived in the next street, and it was she who helped me to get more control over the back. She had modern ideas about using the spine, that was very useful, and I can remember in her classes, we did entire adages on demi-pointe, that gave us the pull up and the strength. This is what must have given Nadia her great strength. To do the promenade on demi-pointe, you learnt to hold the back, to place the weight, and place yourself in space. I can remember falling all over the place, and thinking “I’ll never come back”. But I persevered, and I found eventually, that she was right, one can do it, and one finds that there are points to relax, and a chance to redistribute one’s weight, as one takes more space, or draws it in. Very salutary. One thing I notice at the present time - people just stand about on their feet, they don’t stand through their body, they’re not using their body to stand on their feet. But you are suspended, balance is not standing there balancing, you are suspended in space. This Chinese woman who balances on pointe on someone’s head, or shoulder, is living proof of that. It’s a technical feat, but she has achieved it, by being completely pulled up through the centre, and held. No tension in her head and shoulders. When I came here to Paris to study mime, I had the occasion to see the Noh Theatre. I was fascinated by the technique of ralenti, how someone would appear from the background, seen to be standing stage left or right, and suddenly there he would be centre stage. Of course, he had never stopped moving the whole time, on perfect balance. What control! Or someone would be sitting for ten or so minutes, and suddenly get up and move swiftly. Had I been crouching like that, I wouldn’t have been able to move. So there is a control over the body that permits one to do such dramatic movement. 3/ What happened after you left the Sadler’s Wells School? Well, I first did revue, in the West End, and then joined the Saint James’ Ballet Company with Alan Carter. Amongst the company’s other members were Peter Wright and Beryl Morina, while our choreographer was John Cranko. With Michel de Lutry, his wife Dominie Callaghan, and Sonya Hana (she later became Peter Wright’s wife), we all took part in one of the very early television programmes, BBC’s Ballet for Beginners. We did roughly one televised performance a month, analysing the ballet, and giving its history and performing excerpts. During one holiday, this little company, the Saint James’ Ballet, went on tour. One of the people who joined us was Ken Russell, a friend of a friend, and not much of a dancer. But he did character roles. We did a memorable Act II of Coppelia, with me dancing Swanilda and Ken Russell as Dr. Coppelius! It was great fun, and on tour, we read a lot of D.H. Lawrence, his poems, and later, Ken Russell did the film Women in Love. People from the company continued to work with him when he went into film. When the company went bankrupt, and we were out of work, we knew he was talented, but we didn’t know what for. A friend lent him some cameras, and he went off to study photography. Then he got himself a job on Picture Post doing an article on the teddy boys, a great success. But it was the last issue of Picture Post! And another of her up to her neck in the Thames, with a beautiful hat on. Vogue turned them down though! Anyway, I was working with the teacher Audrey De Vos, and John Cranko was looking for dancers to go with him to Henley-on-Thames. The Kenton Theatre, an 18th Century theatre, was going to be pulled down, and we were wanted to help save it. John Piper, an artist friend of John Cranko’s and Lord [ name ] lent us an old farmhouse on his estate. This was John Cranko’s first company of his own. Its members were Peter Wright, Ken MacMillan, Margaret Scott who came to direct the Australian Ballet School, Sonya Hana, me, and this other boy whose name I can’t remember, and in case we fell down and broke our necks, there were two extras, namely Vassiliy Sulich who eventually founded the Nevada dance company, and Margarita Tait. We were eight, Osbert Lancaster helped, his daughter was our dresser I think, and we lived in this farmhouse, rehearsing from 8 am to 8 pm. John Cranko worked the whole time, and we created new pas de deux, and presented excerpts from ballets he’d already done, Pineapple Poll, Beauty and the Beast that I did with Peter Wright, Tritsch Tratsch, and some new works. This is probably when he influenced Ken MacMillan to choreograph. Shortly after this, I joined the Sadler’s Wells Theatre Ballet. We had no money, only pocket money. Food was provided, we lived in an empty farmhouse, ate at a trestle table someone knocked together, and slept on the floor. You can do that when you’re young! And we did work hard. We got enough money together to save the Kenton Theatre. Everyone came down from London, and John Piper gave a great party in his studio, and I ate peaches soaked in brandy for the first time. The whole studio was lit with candles, it was beautiful. And the smart set came down from London. 4/ How did you end up in France? Well, after that, I had a first accident on my foot. Then I joined the Sadler’s Wells company at Covent Garden. Unfortunately, I had three separate accidents on the same foot, and finally had to give up. There were bone spurs gone into the joint, impossible to operate in those days, and because of that wretched ankle, it became impossible to dance, though I limped on for two years, trying to dance more or less on one foot. But my back started to give out then. I couldn’t sit round in London watching my friends become ballerinas. So I went to Paris to study mime. By the time I got here, Marcel Marceau had left on tour. So I went to Etienne Decroux, and he used to do research on movement, he was then researching walks, so I walked for six weeks day in day out. There I met a young Scottish lass called Faye Lees. I was thrown out of the Decroux school ‘cause I got tired of walking round. Decroux told me not to dance again but to give myself to mime, and I said, “how shall I live?” He said, do like everyone else. I looked round the poor bedraggled half-starved students. I ended up with Jacques Lecoq, who had just opened his school. He didn’t seem to mind that I was a dancer. I stayed with him for many years, and worked in his company. At one point I joined Marcel Marceau, but it was hard to earn a living as a mime. Nor did I speak French well. I did a tour with Gilles Segal and his company, and saw France. In 1959, I was assistant to Peggy van Praagh at the Edinburgh Festival, for the Night and Silence by Walter Gore. There was Henning Kronstam, Carla Fracci, Kirsten Simone, and Yvonne Meyer and Miskovitch did La Belle Dame sans Merci. Later I got a job with the TNP, as assistant to Michel Cacoyannis, for Euripides’ Les Troyennes. He left the chorus in my hands, and that was a great experience. I was then assistant to George Wilson for Brecht’s Mahagony. Then came 1968, and things fell apart. There was no work. And that is when I began to teach, at Asnières in the Maison des Jeunes. I had to walk from Montparnasse to Asnières and back with my dog, because there was no transport. Thereupon, I decided to teach, because theatre was so difficult, and as a mime, it was so rarefied. 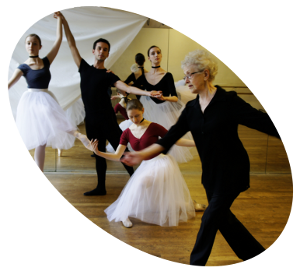 Over the last 35 years, I’ve been teaching in three different Paris Conservatories, and for Claire Sombert at the Marius Petipa conservatory. 5/ You seem to have some doubts about what is now called “modern” dance? What is my concern at the moment is: where does classical dance fit into the picture? Because it has just been abandoned. It’s hard work to become a classical dancer, we all know that. But having achieved the technique, do we just dump it? Contemporary dance is much freer isn’t it? I’m not saying it’s easy, but it doesn’t have the same demands. It may not be easy, but what are they trying to say with it? I find Hip-Hop more open to the world than contemporary dance, and more communicative. Contemporary dance has got very precious, very superior. I can remember someone from India studying mime with Lecoq. He thought that in India, faced with the problem of so many dialects, that he might be able teach people how to improve agriculture, grow their crops, by small mimodramas, which I feel is a proof of how one can go beyond speech. One would hope that one need not be an expert to appreciate the relation between music, dance and so forth. An expert will appreciate the finer points, but it should be approachable to the average intelligent person who goes to the theatre. There must be something there for everybody. I don’t want to look at technique. I don’t give a damn whether people are on pointe or not. However, I do find that contemporary dance demands a strength that women do not have, it places excessive demands on the female body, and therefore they develop a thickness in the legs. 6/ You mean to say that contemporary dance has got too far removed from real theatre? In the 1950s, I danced in the Royal Ballet, Sadler’s Wells as it was called then. We had to be actor-dancers, we had to be able to dance, but we were appreciated for our personality, and what we could bring to a role. Beyond being able to perform technically. They did appreciate a great technique – remember Rowena Jackson! – but there were so many roles for all kinds of performers in those days. I seem to remember de Valois saying “I like his, or her, face”. That would probably be the point at which she would engage that dancer, because they had something more than just a technique. They had a presence, I feel sure it was appreciated. You had a presence on stage. When I think back at the ballets that we danced, such as The Rake’s Progress (I wasn’t in the Prospect Before Us), or Checkmate. That was a drama, a chess game between Love and Death, and Death wins. A chess game – but it went beyond just being a chess game. You had this great drama going on. That repertoire was not appreciated in France, they were much purer academically. In England, though, we did have an adequate technique, it was not despised, and we were always working on it, but the thing was to get beyond the technique, and perform, dramatically, comically, lyrically, or whatever. You had to get beyond that. This is what I personally felt. To illustrate how we saw theatre in those days: Walter Gore was a very interesting person, and a wonderful choreographer. He was the first Rake, de Valois’ The Rake’s Progress was created for him, and I hadn’t seen him dance it, because Robert Helpmann was dancing it. Robert was very dramatic, his last scene in Bedlam where he dies, was grotesque and terrifying. But then I saw Walter Gore perform it, for an anniversary, and his rendering was quite different from Helpmann’s. Gore’s Rake was a weak man, and you could see how he ended as he did. Life was too much for him, he was easily led astray, and easily destroyed, the Country Boy who’d come to London and inherited a fortune. A fool and his money are soon separated! Destroyed by his own naiveté. I’m sure that was much truer to the original ballet. It was harder to believe in Helpmann’s destruction, than the weaker, naive, young man of Gore. I realised this as an afterthought. He was a great artist, and his wife kept his ballets alive for a long time. What a great pity that so many of those ballets have slipped into the unknown, into the bottomless pit of nothingness, including the early Rambert Ballets – many of Gore’s ballets, and Andrée Howard’s as well. Andrée Howard not only choreographed, but also designed and made the costumes as well. She did one for Yvonne Meyer, La Belle Dame sans Merci, with Milorad Miskovitch as the Jeune Homme. This was a poetic allegory. All these things have dropped dead. Andrée committed suicide, I think. She had no work, no-one was interested, but I liked her very much. Marie Rambert discovered so many people, Ashton, Antony Tudor. She eventually went contemporary, no doubt because she could not compete with de Valois, and her ballets were just thrown away. Musical scores, the ballets, the lot, literally thrown away. In London at the time, there was the Sunday Ballet Club at the Mercury Theatre, a platform for young choreographers to present their work. I can remember seeing Walter Gore and his wife doing a ballet called Tancredi and Clorinda, a pas de deux, in this tiny theatre. Anybody who was anybody in the ballet world would turn up, all the critics. You’d see all the choreographers, and it became a regular feature. Now you’ve got nothing but contemporary dance! 7/ Would one get away with a piece of classical choreography today? If you want to shew any classically-derived dance, no-one would allow you to put it on! There is nothing really, save perhaps for that piece I’ve recently seen of José Martinez at the Paris Opera. It was funny, it was classical technique being used with a flourish, and a certain familiarity, they were conscious of it being “classical”, and dominated it, the dance was subdued to the idea, and I thought it delightful. There should be more of such things. Where are the choreographers? This is what we lack. We lack people who have a thorough education in dance. It’s like listening to music that’s been “composed” on a synthesiser. You’ve got to have people who’ve been trained to actually write music, rather than just pushing buttons. And so you’ve got to have someone who’s been trained as a dancer, a classical dancer. Technique must always be subdued to the idea, and the idea should never be dominated by technique. People today say Fonteyn had no technique. I say, dancers today are trained as athletes. But they’re nowhere near as good as those athletes who throw hoops or clubs, and catch them with their toenails or whatever. Dancers are much more skilled, better trained, teachers know more now about training a body than they did seventy or eighty years ago. However, you had people like Fonteyn. So far as I’m concerned, she had a great technique. Because she put across an entire performance, a personage. She was a great artist, her inadequacies, if there were any, were never apparent, I never felt that she was lacking in technique when I saw her dance. I always felt that she had a wonderful line. She never sought to do a six o’clock or a half-past-twelve arabesque, it didn’t seem necessary, but she had a perfectly held back, she had great elegance. She could not do six or seven turns, but it didn’t seem to matter. Margot appeared on stage, and you knew someone had come on. She didn’t creep onto the stage! When she made an entrance, something happened. And this, I think, a lot of English dancers that followed on, had this tradition, of being able to make an entrance, a personality, something would happen. Again, technique: Nadia Nerina was a wonderfully strong dancer, we used to say she didn’t need a partner, because she could do the pas de deux on her own. Ashton created the La Fille mal Gardée on her. The cat’s cradle - so complex, yet so beautiful - and the ballerina on balance the whole time! Nadia had such strength, such brillance, and the role, though technically very challenging, she did it as though snapping her fingers. Nadia worked with Cleo Nordy and Audrey de Voss, as did Beryl Grey. Incidentally, Holden who created, I believe, La Mère Simone in that, was quite fantastic. There you have the strength of the English ballet as it was at the time. One of the greatest character dancers, he could do anything. Yes, I most definitely do. For example, in Manon, when she makes her entrance at the party, it’s not just because the people on stage turn to look at her that you notice her. You notice her because she has made an entrance. Lynn Seymour had this power, of persuading, of being on stage, she could compel your attention, not by doing frantic gestures, just by being there, by being there so concentrated, so true. So consciously in her role. Such affirmation in her presence, you could feel it. Seymour was a dancer-actress in the real tradition of the British dancer of the period. You had to have that presence. It was encouraged. It’s NOT star quality. It’s being of the theatre, it’s playing a role, preparing a role. It’s living out, as an actor, the role that you’re performing. 10/	What about the mime roles? In the Royal Ballet, you had principal dancers, and they were the technicians. And you had principal character dancers, and they were principals too, and they would walk on as the Queen in Swan Lake, and dominate the stage. Not some little girl who’s not considered good enough to dance anything else, and you tog her out in clothes and send her out, and try to convince everyone that she’s a Queen. You had people on stage, who had been fine dancers in their time, and they would perform those roles. And this adds to the dramatic strength of a company. This tradition is carried out in Denmark still. I can remember Kirsten Simone as a beautiful dancer, and then seeing her again in one of the character roles. 11/ How does this question of drama, relate to how Myrtha should be danced? Giselle today is badly imbalanced, because in Act II, the dominating presence should be Myrtha, who is there like an evil spirit. We should have an alternation between Myrtha, foiled by the power of love, which is what Albrecht and Giselle emanate (he’s not worthy of it, but still...), while Myrtha has the power of hatred. Myrtha is taking revenge, while this poor creature, despite of all the wrong, has this great love, and we come again to the game of chess that de Valois played in Checkmate. The power of love, and the power of darkness. Which was Myrtha. I’ve seen some wonderful Myrthas, technically, that move without touching the ground. It’s a very important character. Without diminishing the role of Giselle, there would be far more interesting drama on stage if you had a great actress, as well as a great dancer, performing Myrtha. As for Hilarion, no, he should not be hilarious; he should be a great actor, and he should not be hideous, he should be handsome. He should be a young man who’s a young peasant, worthy of respect, but he gets eaten up by jealousy, by this person whom he knows is a cheat and liar, an interloper. It’s so exciting, when you get those ballets which have got something to say, with characters that are so rich and meaty, if one only took the time to look for it, and interpret them in some way other than just as a technical feat. It’s a technical feat to be able to perform a role! The question is, how do you get the role across, how do you project it? No-one’s interested in this now, they’re so much more interested in technique, in the height of the leg, than the theatrical aspect of the dance. And don’t tell me that that’s what they’re doing in modern dance, because I’ve seldom been moved by it, save for a David Parson ballet I saw a few years back. I’m not writing off contemporary work. I love The Moor’s Pavane, beautiful if it’s danced dramatically. As so little attention is paid to the dramatic or comic content of the ballet, classical dance can easily be dismissed as being null and void. So much importance has been given to the actual physical technique, that people now believe they only express themselves when they’re released from the straitjacket of danse academique. To play the violin, you’ve got to master the technique, and then you play with your heart and head, not your fingers. 12/ But people say they’re bored by mime! In mime, the gesture must be linked to the feeling, not lost in beautiful but meaningless port de bras. The gestures must be precise, and clear, as to what they mean, and yet you’ve got to give them the spontaneity of speech. Each moment, has got to have a precise, focused feeling behind it. Simple, direct, without any mannerisms. Mime in classical ballet has suffered a great deal from being befogged, mystified. Sometimes, when you ask, no-one seems to know precisely what the gesture was! In the 19th Century, pantomime was an art being performed in popular theatres, so you had the tradition, and it was easier to take popular mime, and transfer it to the classical theatre. Refine it. Pantomime as such is no longer popular, although when people see Jean-Louis Barreault in Les Enfants du Paradis describe how someone had his watch stolen just by gesture, this is always a revelation to them. That’s one of the reasons I cannot enjoy Nureyev’s productions: he’s cut out virtually all the mime. He was quite ignorant, really. 13/ Are things quite so bright and bouncy as some would have it? I’m worried about the future of dance. I see so much being lost. What we are seeing on too many stages, at the present, are things turned out by people who have discovered dance in workshops, often at university level. And although it’s interesting and enriching for the individual to take part in such workshops, where they discover their bodies, space, movement, the philosophy and language of the body, they are NOT pioneers! This has already been done! And though it’s new and exciting for THEM, they should not be getting all the money, all the grants, and monopolising the modern stage. When you look at the Bournonville exercises, they look so easy. And they are not. That is a marvellous sort of illustration of the point of dominating a technique, so it looks easy. One feels that anyone could do it. It’s only when you try that you realise that you’ve got to work very hard to achieve that simplicity. Contemporary dance is the easy way out. We’ve got to start producing choreographers, who have not been born in these university workshops. In dance theatre, we get girls lifting the men! They have to carry their great lumping partners about the stage! There has to be room for the evolution of people who are professional classical dancers, and who have a tradition behind them. They too must be helped We must not abandon the classical foundation, developed over the last four centuries, in favour of what I call the university students. 14/ Would you be getting a John Cranko, for example, at the moment? That’s a good example, John Cranko. De Valois was interested in him as a personality. He began to choreograph very young, it was obvious that he loved dance, and theatre, but he had not the physique to become a great dancer. In no way was this an impediment to his dancing at the level he was capable of, and he joined the corps de ballet at Sadler’s Wells, where he learnt his craft. He was able to study the classical ballets by taking part in them, seeing them on stage, lit, rehearsed, and that gave him his background. And then he had this creative drive as a choreographer! But John Cranko would never gain entrance to a major classical academy today. He might, with luck, be taken into a modern dance group! And there they might employ his talents, but he would always be lacking that basic education of the classical dancer. John Cranko would have been a very frustrated person, I should think, had he started out today. In classical dance, we’ve so improved the technique, that we’re forced to look for a physique that can perform it. And we have therefore reduced the pool of available talent. A great pity. We have so ‘”improved” technique, that we’re destroying ourselves. Youngsters coming into the dance world today, have better training, in that you have teachers who’ve been better taught. We’ve got looser backs, higher legs, more turn-out, good feet. When you look at old photographs of the corps de ballet, you realise that they were not that turned out, they did not have good arms, or whatever. People are much more turned out today, they have greater access to technique. But to achieve this, we’ve had to cut down on who shall be allowed to dance. The price has been, to cut out anyone who’s got a longer torso, or broader hips, or a shorter neck, or whatever, we’ve criticised and selected. This selection has enabled dance training to LOOK better, but in many cases we have thrown the baby out with the bath water. You’ve lost probably the John Crankos, the Andrée Howards of this world, people who might never have become a principal, but who have so much to bring to the ballet. I have such satisfaction watching classical exercises danced perfectly, that it’s almost enough. Because the ballets that you see deriving from that technique have so fallen into the monotony of performing the same ballets over and over, while they haven’t bothered to do any research in employing that technique in new ballets. 15/ Has one got a right to be bored, in some minuscule role? Once you’re on stage it’s almost sacred, you have no right to be bored. No matter what you do, even if you ARE bored. You must find some way of animating yourself, mentally and physically, so that you don’t sink into habits of boredom. If you do, then you should leave. If you’re bored, get out! It’s a mental discipline, of applying yourself, and of being a professional. It’s part of being professional, not to allow yourself to be bored. If you’re bored, you owe it to yourself to find the right job for yourself. To look further afield. Perhaps you should be teaching. Perhaps you should be doing something else! Learning to type! You owe it to yourself as a human being, to find out what you should be doing. Even if it’s sweeping the street beautifully, there’s no shame in that. You must not give in to boredom. No-one will be inspired by you, and want to use you in a ballet. So you’ve got to work hard, and continue to learn, to absorb, to know. read history, study the piano, make yourself interested in something. Don’t fall asleep like a bird on one leg. In London, I used to go the theatre. To see other things, or go to a concert. It’s a question of using the whole body. It’s not a very big movement. I tell them to move the shoulders horizontally, not collapsing the upper body, and then the whole body must take up the position. You must feel the épaulement in the whole body. I tell people that épaulement is in a way, the sensuous side of classical dance – it’s as though you were delighting in the sensation of throwing a splendid fur over your shoulders in winter, or let fall a clinging garment in summer. The position of the head in relation to the épaulement is very important. I teach my pupils the positions of the head. For example, in mime, if you come on stage, and instead of standing straight, you stand with the head inclined, this is already not neutral. It’s not nothing! It’s already an expression. It can be sad, alert, it can be uncertain, it can be apologetic, it can be whatever you put into. The position helps, but it’s the THOUGHT behind the position that must be projected. There’s so much one can read into the same position of the head. By lowering the head, one can cut off from the audience, shyness, or perhaps a sullen reserve for example. Raising the head above the audience, can mean not speaking directly to the audience, unless it’s to the upper balconies perhaps. It’s beyond, above them. And then there are the more subtle movements, that combine the two, inclined and raised, inclined and lowered, and so on, by degrees. If one turns the head brutally, that’s hard to do, it becomes very 1930s. Or just off-centre, a quarter-turn, and then one inclines, that becomes almost romantic. The position of the head, the direction of the eyes, is all part of communicating, which has become unwitting today. I have great difficulty to get dancers to communicate at the present time, and to grasp the point, that by using épaulement, one can speak as though in dialogue. Use the épaulement to build your character, the way you go with the dance, and your head. There are so many things that might seem to be cliché, when you’re teaching, it’s like saying “No, thank you. Thank you. Please. May I? and so on.” Clichés can be controlled by the way you think about them. So many people forget to think while they dance. You must think while you dance. You’ve got to think of the character you’re performing, the line of dance, the theme of your dance. You’ve got to remind yourself of that. I don’t mean thinking of technical difficulties. The mere fact that you’ve got to come to grips with the idea, helps to overcome the difficulty. 17/ How did Ninette de Valois bring people forward? People given a chance to dance the role of their choice, even when not ready, will often come up to scratch. People will never be ready unless they’re given a chance to dance. It was good when we had both Sadler’s Wells Theatre Ballet, as well as Sadler’s Wells at Covent Garden. De Valois had the brilliant idea, that with youngsters straight out of the school - whether she had no direct place for them, or whether she thought they would benefit from touring – should be given a chance to dance roles that they would not be able to deal with straight off at Covent Garden. Thus she had Sadler’s Wells Theatre Ballet, a group of young people between fifteen and twenty-five, and as their principal choreographer, John Cranko, who was their age, perhaps twenty-three, and Peggy van Pragh who was then about forty-two. It was a young company, and we had ballets that were suitable. John wrote Pineapple Poll for us, and we got a chance to dance. Svetlana Beriosova was there, dancing principal roles, because she was young, and so was Nadia Nerina, Patsy-Anne Heaton, Ken MacMillan. We all travelled round, in one-act ballets, and we’d do Act II of The Swan Lake. We’d all dance the classical roles, and that was when Beriosova got her first stab at Odile. One extraordinary girl was the Australian Elaine Fifield, a fine pianist as well as a dancer. Jack Lanchberry, her then husband, used to take the scores home, and she would play the piano reduction herself, and so when she went into rehearsal, she knew the music from beginning to end, and the choreographers were wild about her, because she was so musical. But she never ever said, “I play the piano”. She was a very retiring girl, and a lovely dancer. It was for her that Cranko created Pineapple Poll. Now, Sadler’s Wells Theatre Ballet has gone up to Birmingham for good, and become a company in its own right. We no longer have that training ground! Sadler’s Wells Theatre Ballet did some very good ballets. We all got a chance to dance. You did a principal role, and the next day you were back line of the corps de ballet. You did secondary roles, you did everything. You got a chance to dance everything. I know that in Pineapple Poll, I did one of the girls, there were Sweethearts and Wives, I was a Sweetheart, then did Poll, then I did Auntie Dimple, and THEN they wanted to give me a role as a Wife on tour, but when I heard the music I could no longer remember what role I had to go on in! Then I would do walk-on roles as well. You had no time to have a big head. You were not a star. People would teach each other, we would help each other, so that when you did the rehearsal you’d get more out of it, than if you hadn’t seen it, because sometimes you’d never seen the role y you’d been on stage and couldn’t watch properly. This helped me when I came to teach, because when I had somebody who would be doing one of my roles, I’d help them to learn it, and rehearse it, and then I’d realise that certain steps would not suit that person, if done in the way I’d done them, and we’d have to find a way that would suit her. We were learning to discriminate about the adaptation that was necessary, even if you were doing the very same role. And that was good training. We were very loyal and friendly. There was not much rivalry. We used to accept our lot. I personally did not feel rivalry. Sometimes I was disappointed, but that was too bad. Probably Claude Newman. Editor’s note.